So the other day I was watching Food Network, and I saw Robert Irvine make a white pizza sauce using cauliflower on a special Restaurant Impossible. His recipe wasn’t SCD friendly, but it didn’t seem too hard to adapt. It turned out it wasn’t hard at hall, and it is pretty tasty too. I just used a simple crust adapted from Grain-free Gourmet. I’ll just start off by saying I had tons of sauce, and I only ended up putting about half of the cooked cauliflower in the blender. I had enough for my pizza and the separate one I made for my husband, and still a little left after that. Chop cauliflower and boil in a large pot for ten minutes or until tender,. Drain.Place half of it in a bowl to use for something else (you also don’t have to cook the whole thing). Place water, yogurt and some of the cauliflower in a blender. Puree. Slowly add the rest of the cauliflower and puree until smooth. Add cheese and spices. Blend on lowest speed until mixed. Mix all ingredients in a bowl. Stir until well combined. Batter will be thin. Spread batter on baking sheet so it is very thin. Bake for ten minutes until batter is firm and golden around the edges. I roasted my tomatoes, mushrooms, and onions. I sauteed my asparagus, zucchini, and yellow squash. Top with toppings, except fresh basil. Bake for 12 – 15 minutes until hot and cheese is melted. 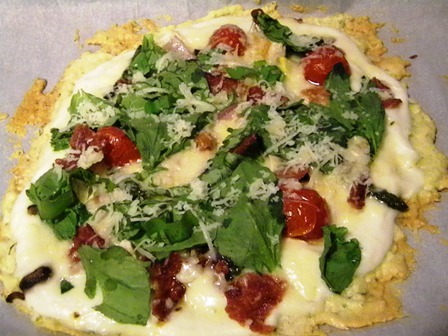 Remove from oven, top with fresh basil. Allow to cool a couple of minutes, slice and serve. My crust never turns out crispy enough to pick up, but it tasted good. that looks so delicious! i could totally go for a slice right now!